Use as a secondary label with name labels, or use as primary coding labels. 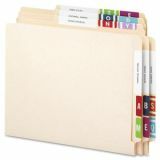 Wraparound labels are readable from both sides of file folder tabs. Note: A minimum quantity of 30 must be ordered, and in units of 5 thereafter. 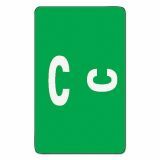 Smead Alpha-Z Color-Coded Second Letter Labels, Letter C, Dark Green, 100/Pack - Color-coded alphabetical labels help put an end to misfiled records and cut filing and retrieval time. Labels wrap around the folder tab (top tab or end tab) so they are readable from both sides of the folder. Color is compatible with other Alpha-Z label styles. Clear laminate keeps labels clean and colors bright, even with frequent handling. Each sheet has 10 labels.